Oil prices stagnated yesterday, finding support from the stock market’s recovery but unable to rise on its own. A slightly bearish EIA monthly report countered bullish inventory data from the API, keeping prices in check. Prices yesterday ended within a nickel of their opening price. Today, crude prices are down a bit, though losses are not as steep as they’ve been in recent days. Crude oil is currently trading at $63.05, a loss of 34 cents. Refined products are seeing mixed action this morning. Yesterday, both products posted significant losses, with diesel prices falling to $1.9851 and gasoline prices dipping to $1.8052. For diesel, yesterday was the first time prices have dipped below $2/gal since late December. Diesel prices, which showed a large stock gain in the API data yesterday, are falling today, currently trading at $1.9725, a loss of 1.3 cents. Gasoline, which saw a slight inventory draw, is currently up by almost half a cent, trading at $1.8095. 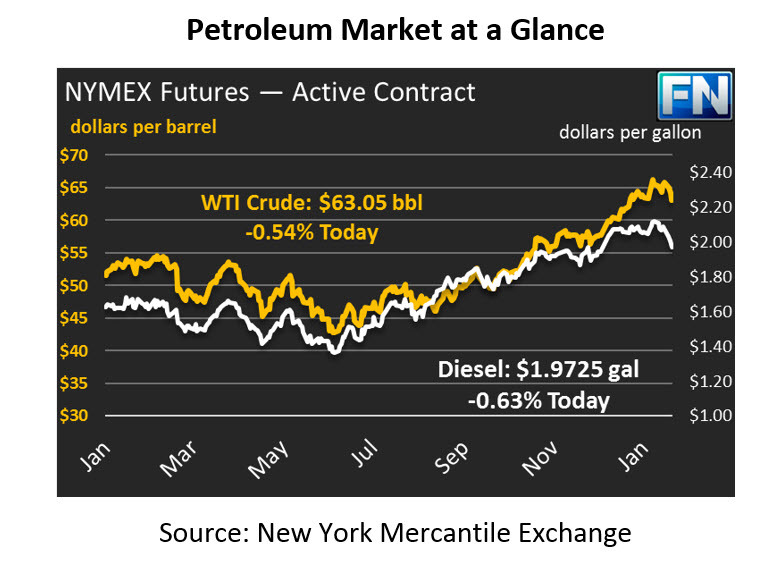 The API’s data drew mixes reactions from the market, as crude, diesel and gasoline data were all directionally opposite of market expectations. Crude oil, expected to rise by 3 million barrels (MMbbls), showed a 1.1 MMbbl draw. Gasoline stocks showed the same. Diesel inventories, expected to fall due to continued demand and exports, showed a significant build. While the API’s data was bullish for crude oil, the EIA’s monthly Short-Term Energy Outlook (STEO) released yesterday created slight downward pressure, revealing rising U.S. output while demand stayed mostly flat. In fact, the EIA predicted that U.S. output could surpass 11 MMbpd during 2018, a new record. The EIA acknowledged the counter-seasonal crude draw in January, noting that seasonally high refinery input rates and crude exports contributed to the draw.